Image From Ferris.edu A sprue is simply the channel that guides molten plastic from the nozzle of the injection molding machine to the entry point for the entire injection mold tool. It is a separate part from the mold tool itself. 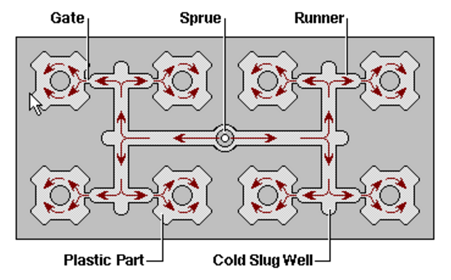 A runner is a system of channels that meet up with the sprue, typically within or as part of the mold tool, that guides the molten plastic into the part cavities within the mold tool. There are two principal categories of runners (hot and cold) which you can read about here. Lastly, the gate is the part of the channel after the runner that leads directly into the part cavity. After an injection mold cycle (typically only seconds long) the entirety of the molten plastic will cool leaving solid plastic in the sprue, runners, gates, part cavities themselves, as well as a little bit of overflow potentially on the edges of the parts (if the seal isn’t 100% right). Thermoset material, such as an epoxy resin that cures once exposed to air, is a material that cures and would burn after curing if one attempt is made to melt it. Thermoplastic material by contrast, is a plastic material that can be melted, cool and solidify, and then be melted again without burning. With thermoplastic materials the material can be recycled are used again. Sometimes this happens right on the factory floor. They grind up the sprues/runners and any reject parts. Then they add that material back into the raw material that goes into the injection molding press. This material is referred to as "re-grind". Typically, quality control departments will limit the amount of regrind that is allowed to be placed back into the press. (Some performance properties of the plastic can degrade as it is molded over and over). Or, if they have a lot of it, a factory can sell this re-grind to some other factory who can use it. Typically regrind material is used for low-quality parts that don't need high performance properties. Two of the major disadvantages to injection molding are the high tooling costs and large required lead times. 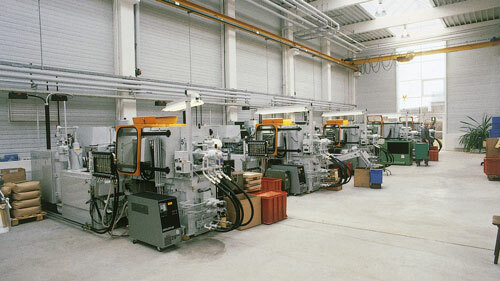 Tooling is almost a project in and of itself and only one phase of the entire injection molding process. Before you can produce an injection molded part you first have to design and prototype a part (probably via CNC or 3D printing), then you have to design and prototype a mold tool that can produce replicas of the part in volume. Lastly, and typically after extensive testing in both of the aforementioned stages, you get to injection mold a part. As you can imagine, all of the iteration required to get the tool correct prior to mass production requires both time and money. It is rare that you would prototype an injection molding tool. It does happen though, especially for parts that will be made in a multi-cavity tool. For example, let's say we were going to injection mold a new shampoo bottle cap. That cap would likely have threads to attach it to the bottle, a living hinge, a snap closure, and potentially some overmolding too. A company may choose to make a single cavity tool of that part to make sure all of the features will mold as desired. Upon approval, they will make a new tool, that is capable of molding, for example, 16 caps at a time. They do the single cavity tool first so if there are any issues, they don't have to pay and wait for it to be fixed 16 times for each cavity. One of the most obvious advantages to injection molding is that the housing serves multiple purposes. First, it serves as a handle for the end user to interact with. It also acts as a receptacle for the battery and motor as well the location of various screw bosses that will be used to fasten the device together once the internal parts are assembled. In other words, injection molding is extremely effective when you need to organize a lot of internal parts within a housing. As a consequence, it’s a fantastic way to reduce the number of total parts (“piece count”). Of note, this part is also an overmolded part. Some of the other reasons that injection molding is a good fit for this example include the fact that the drill is being produced in large volume. 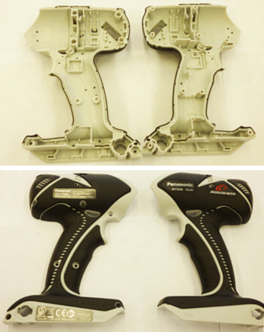 That is, Panasonic is creating a large number of copies of the same drill handle. 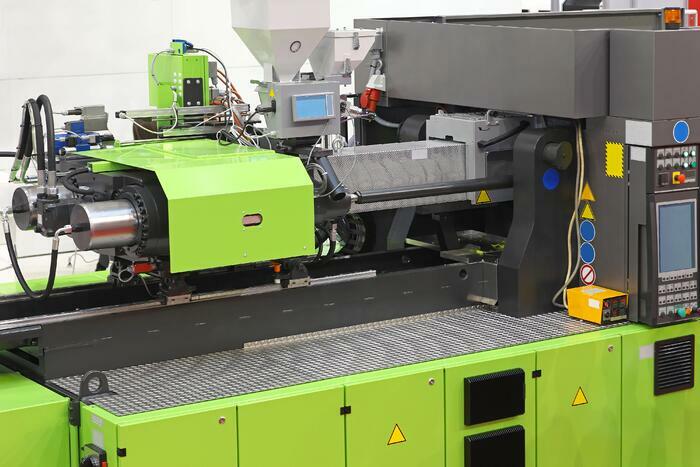 Injection molding is wonderful for this kind of high volume production because the high initial costs pay the manufacturer back over time with low per unit costs. For this same reason injection molding can be a poor choice for low volume production. Additionally of note, there are some design constraints if using injection molding. For example, the part has nearly uniform wall thickness (which is important in order to avoid defects), and the part is made with a thermoplastic material (allowing for solid plastic stock to be repeatedly melted for the procedure). If you were designing a part with a thermoset material then injection molding would be more nuanced. You can injection mold a thermoset material but you can only do it once. Trying to melt a thermoset plastic a second time will result in burning the material. Similarly, a part with varied wall thickness would require more attention in the mold tool design to ensure uniform cooling and to avoid defects during production.